Well, here we are getting used to life again back at home. We’re over our ferry lag and the car has had a new windscreen fitted courtesy of the insurance and a £75.00 excess. Ferry lag? Yes, ferry lag. There’s only a one hour time difference between ourselves and France (France being ahead, for anyone who is unsure) but, whenever we return, we always wake up disgustingly early for a few days. This was a great trip – one of the classics. This was one of those trips I dream of. We had pretty close to five weeks of unbroken sunshine (apart from the setting at night, of course) and were lucky enough to make many good choices as to where to stop. And it is, believe me, largely a matter of luck. The dragonfly spotting in La Brenne and Provence was good but the crowning glory had to be six gloriously sunny days in the Pyrenees at the end. Given the correct weather, such mountains are magnificent and this time they were utterly fantastic. The return trip was a bit naff but, hey, I was just driving. Here’s one final thing that I feel the need to “share”. Motor vans are very popular these days. I really have no idea of the reason; in my view they are more expensive and generally less flexible than a car and caravan. about 50% of their space is taken up with the de rigeur fixed bed these days. About another 25% is the driving cab leaving very little actual living space in your considerable investment. 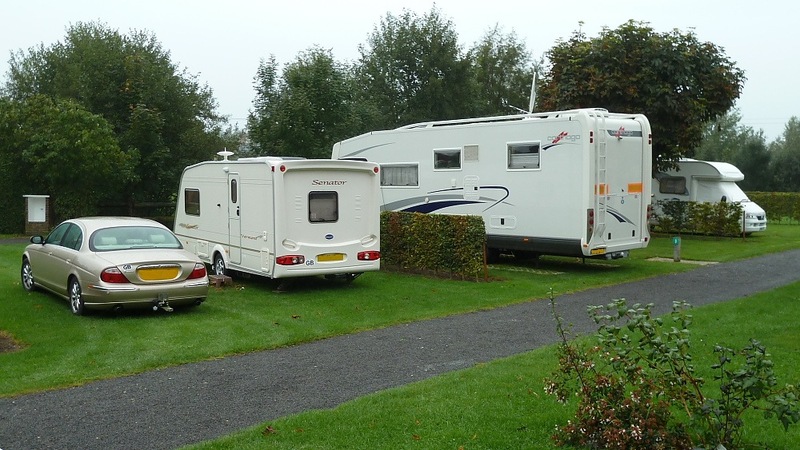 I actually find them slightly irritating as they drive around towing a car behind them on a yoke and, after sensible folks who’ve been installed since 4:00 PM are thinking they’ve found a nice quiet campsite for the evening, half a dozen of these damn things swarm in at 7:00 PM and ruin it. Still, popular they are and that’s just me and my little problem. Here, however, is an example of what I find completely offensive. I don’t think this is actually American but it’s certainly based upon the Winnebago concept. It’s huge. It dwarfs everything sensible on the campsite. Just look at it beside this Bailey caravan (not unlike ours) and Jag tow car. There can’t be many sites with pitches big enough to accommodate a thing like this. I looked on a website to see what I could find out. I’ve blanked out the registrations but this is an ‘06 plate so the models have changed. The price ticket on this ugly mo’fo’ is something between £90K and £150K. Talk about conspicuous camping. Obscenities like this don’t fit European campsites. Indeed, they don’t fit Europe. It’s all very well for those living in it but we’ve got to look at it. OK, end of Hitlerian rant. We had a wonderful time and now have to face the winter. Let’s hope it’s not too long or severe.